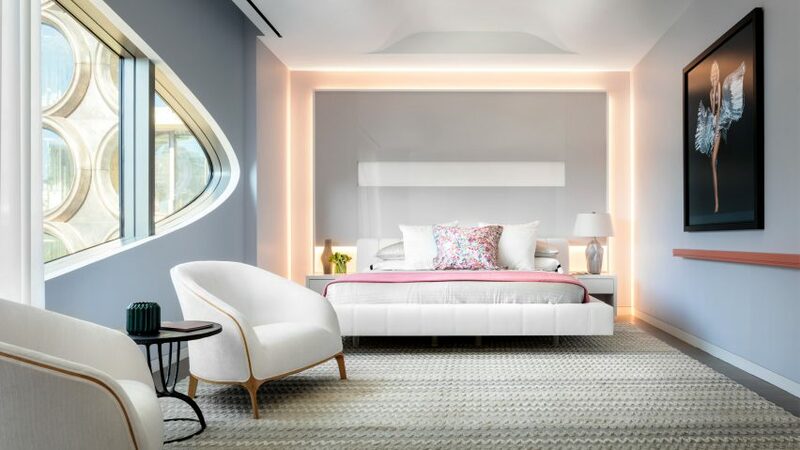 Two show apartments have opened inside Zaha Hadid Architects' 520 West 28th project, nearing completion in New York's Chelsea. With construction work on the 11-storey luxury condo building almost complete, developer Related Companies is hoping to entice buyers to snap up the remaining units. The project – the late architect's first in New York – includes 39 residences ranging between two to five bedrooms and priced from $4.95 million (£4 million), up to $50 million (£40.3 million) for the penthouse. Interior designer Jennifer Post was tasked with created the interiors for one of the four-bedroom homes. 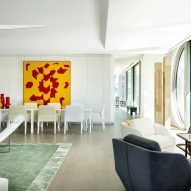 The 4,500-square-foot (418-square-metre) apartment features a muted palette, with pops of colour provided by artwork. "I am usually the creative visionary behind both the architecture and interior design of a space," said Post. "Here, I am respectfully creating a vision that coexists with the vision of one of architecture's greatest minds." A minimal interior for a smaller 1,700-square-foot (158-square-metre) condo designed by West Chin Architects has also been unveiled. Post's intention was to create an interior that "coexists with the vision of one of architecture's greatest minds"
Residents who have already purchased condos are scheduled to start moving in June 2017. 520 West 28th sits adjacent to the popular High Line park in New York's trendy Chelsea neighbourhood. Earlier this year, it was announced that a portion of the building would be turned into art galleries, with further exhibition areas built under the elevated public space. Zaha Hadid Architects also recently revealed its design for a supertall tower for Midtown Manhattan, which is being developed by the family of Donald Trump's son-in-law. Other show apartments for luxury developments in New York include a Kelly Behun-designed penthouse at 432 Park Avenue. Photography is by Scott Frances.